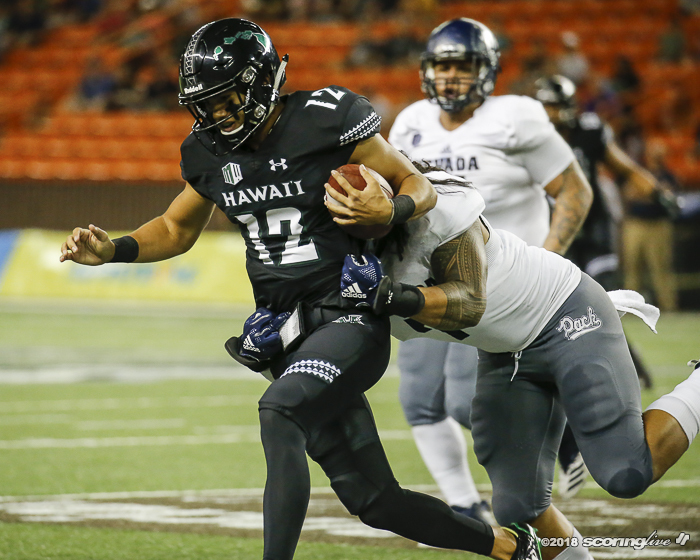 HALAWA — The Wolf Pack racked up 481 yards of total offense with 220 on the ground and four rushing touchdowns to roll up the Rainbow Warriors, 40-22, Saturday evening at Hawaiian Financial FCU Field at Aloha Stadium. 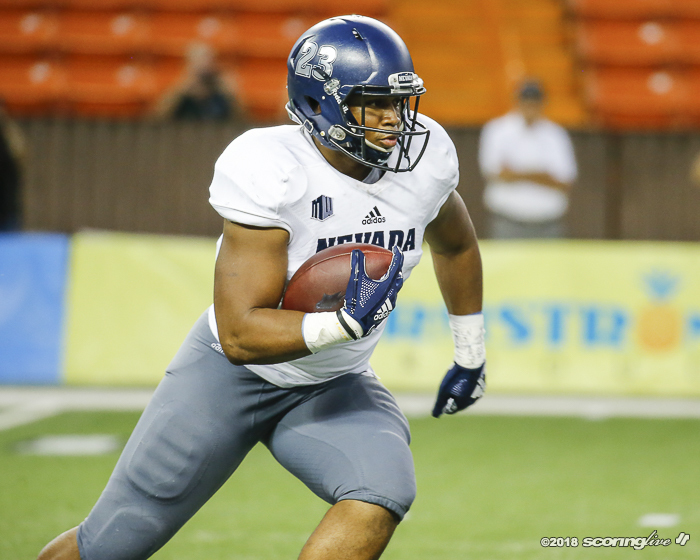 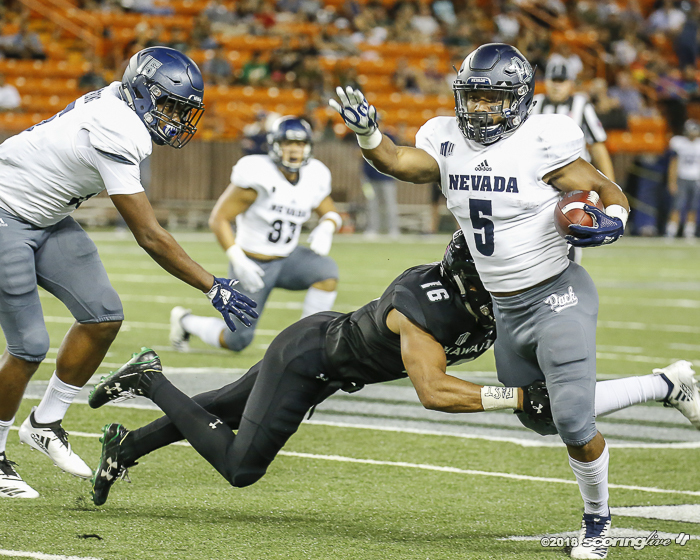 Devonte Lee carried the ball only six times for 29 yards but found paydirt twice on runs of five and six yards while fellow freshman Toa Taua did most of the heavy lifting with 18 carries for 126 yards and a TD of his own. 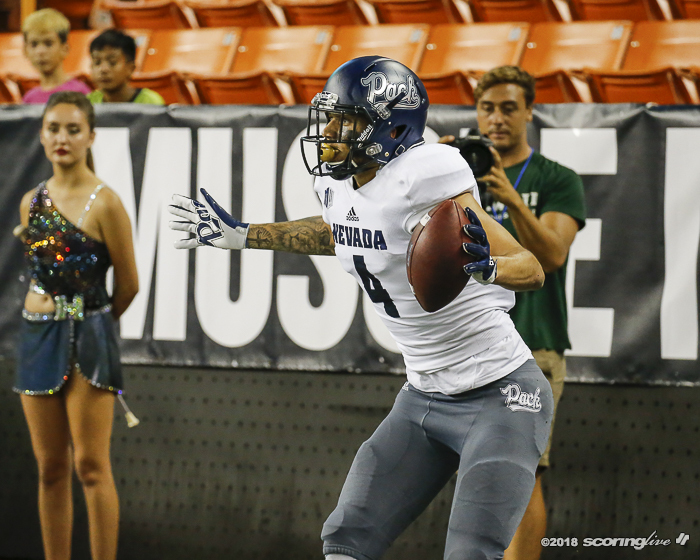 Sophomore receiver Elijah Cooks added a 40-yard score on a simple swing (backwards) pass to the right side where he outraced everyone to the end zone. 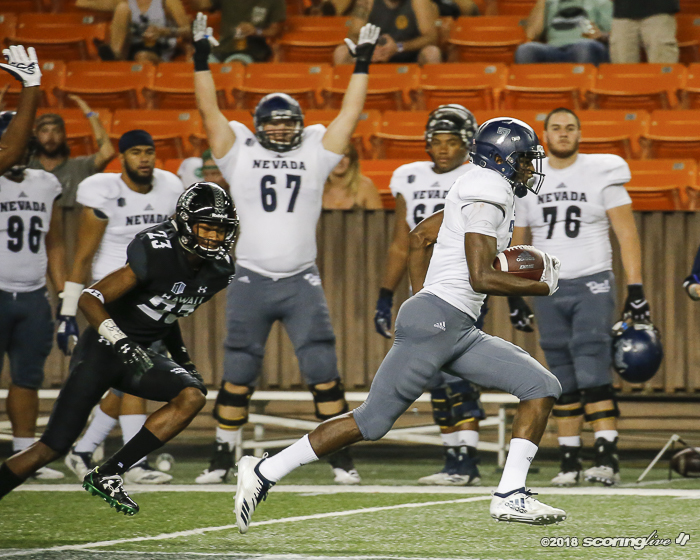 Cooks also scored Nevada's first touchdown of the game on a 29-yard dime from quarterback Ty Gangi. 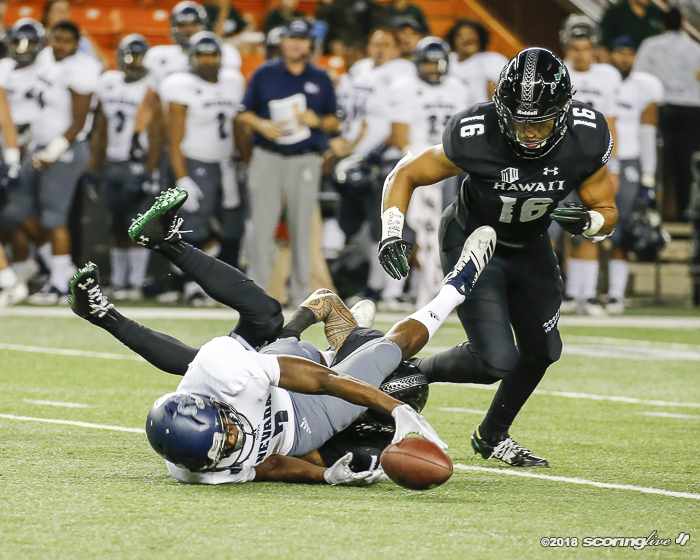 "You don't necessarily feel like you got beat. 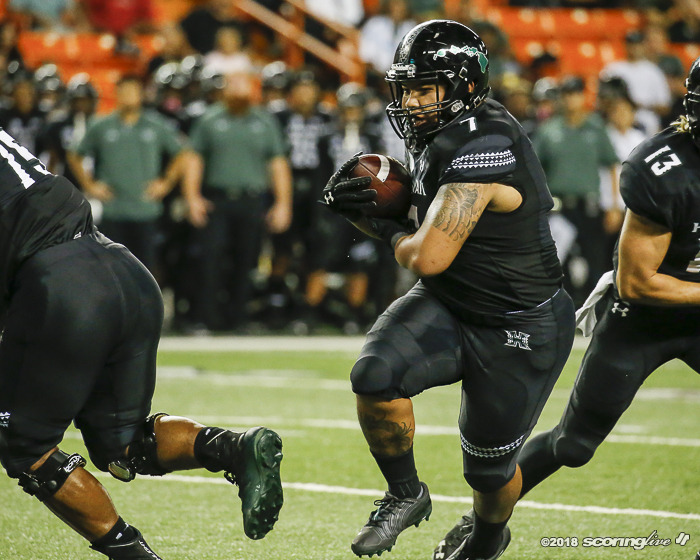 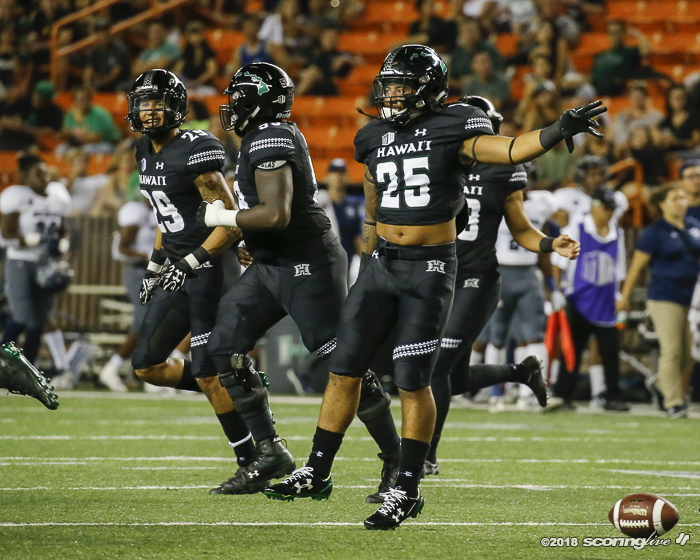 You feel like you lost it because we weren't very clean," Hawaii coach Rolovich said. 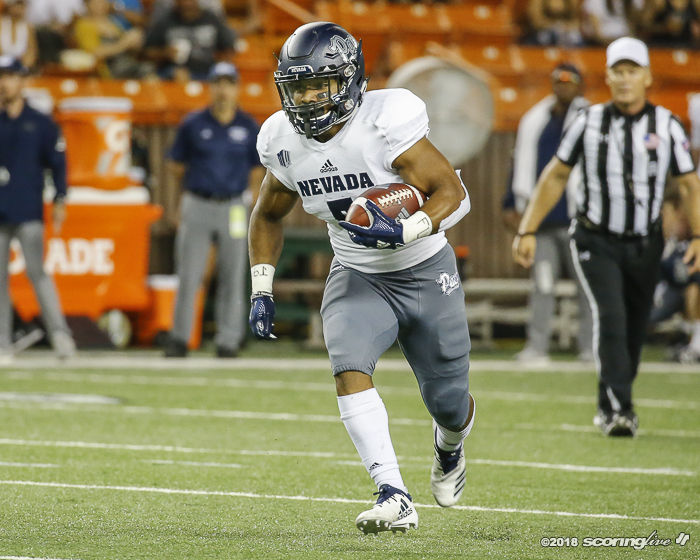 "(Nevada) made a lot of football plays. 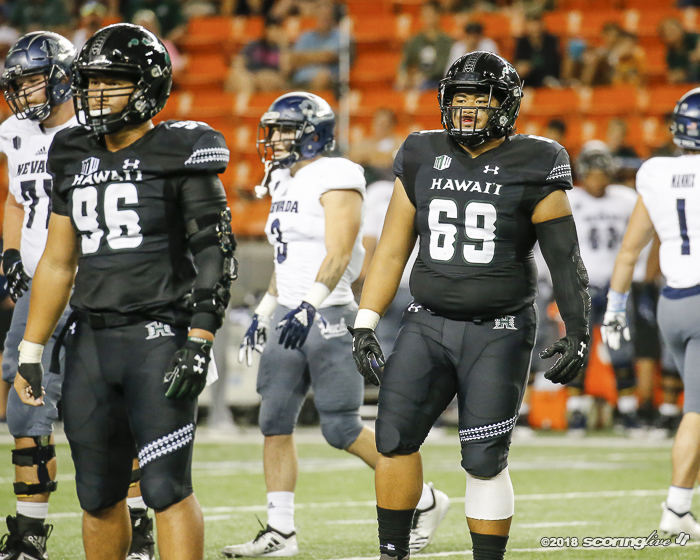 They played well, they played hard. 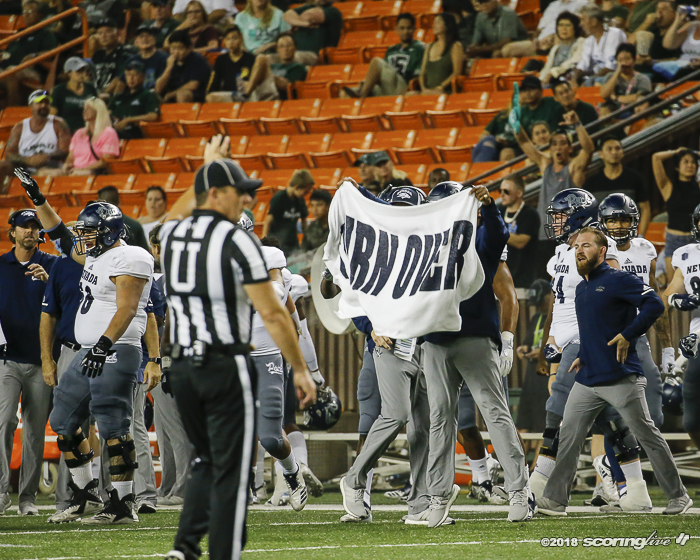 We did not on any side of the ball. 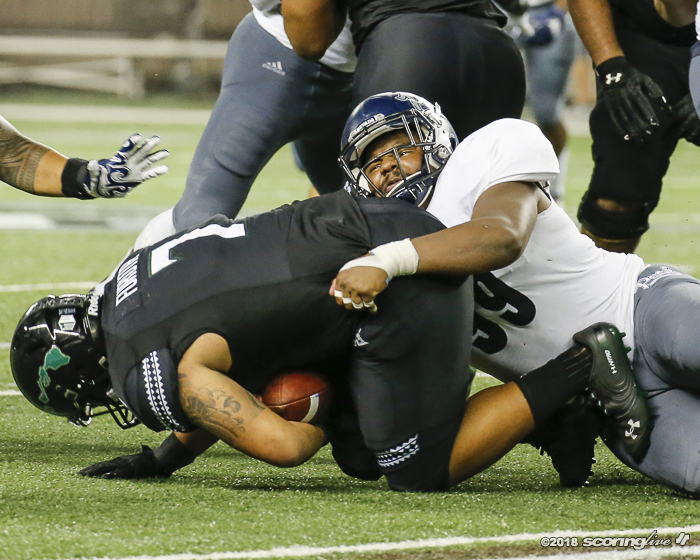 It wasn't really a lot to be smiling about." 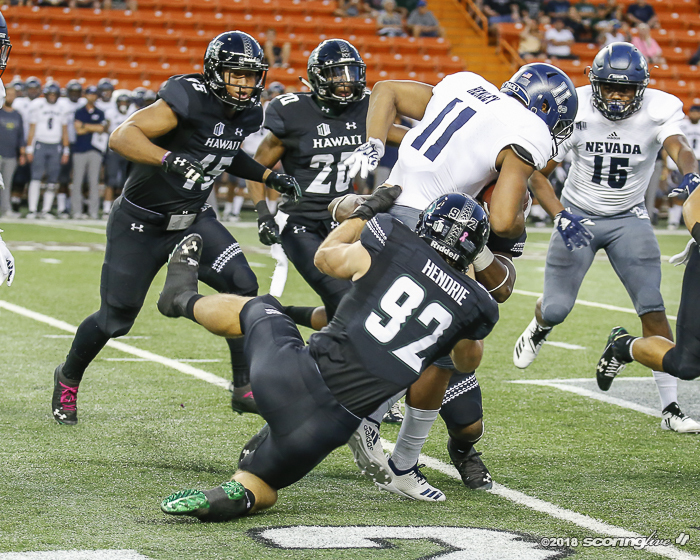 Hawaii dropped to 6-3 on the season and were handed its first loss of the Mountain West Conference season to fall to 3-1. 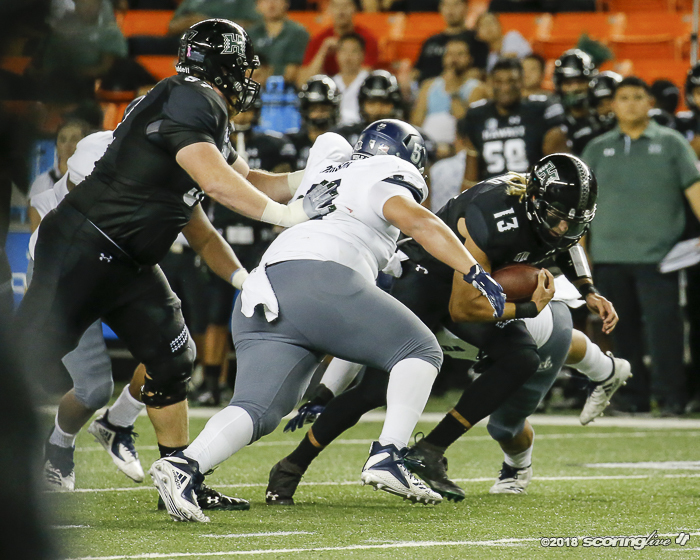 Despite the end result, it was a tight game through the first 15 minutes. 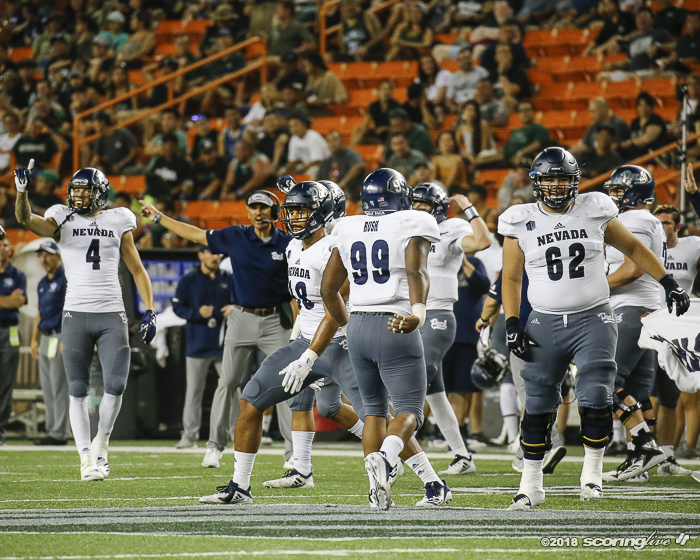 After forcing Nevada to punt on the opening drive, Hawaii had to punt the ball away as well but the return was muffed and longsnapper Noah Borden (Kamehameha '12) came out of the dogpile with the recovery at the Nevada 28. 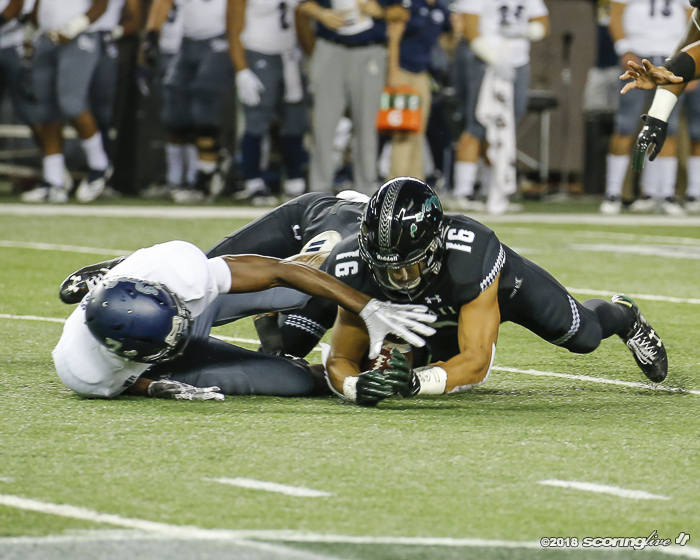 Three plays later, Cole McDonald hit Cedric Byrd on the left seam for an 8-yard score. 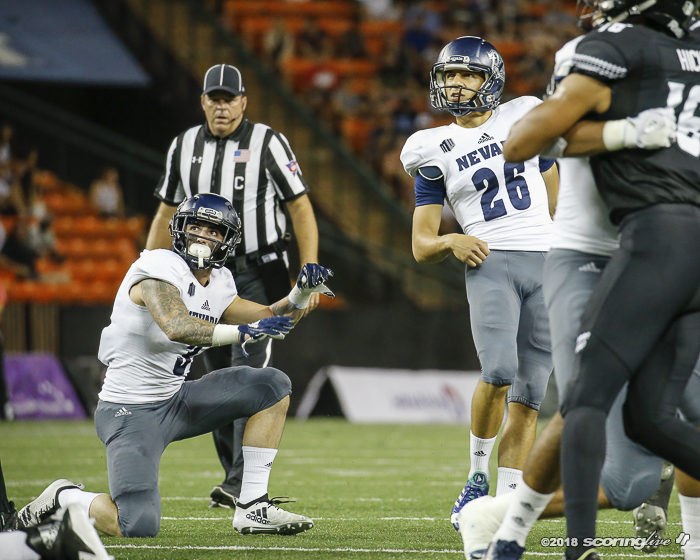 The Wolf Pack answered with a 23-yard field goal and later on Gangi's connection to Cooks. 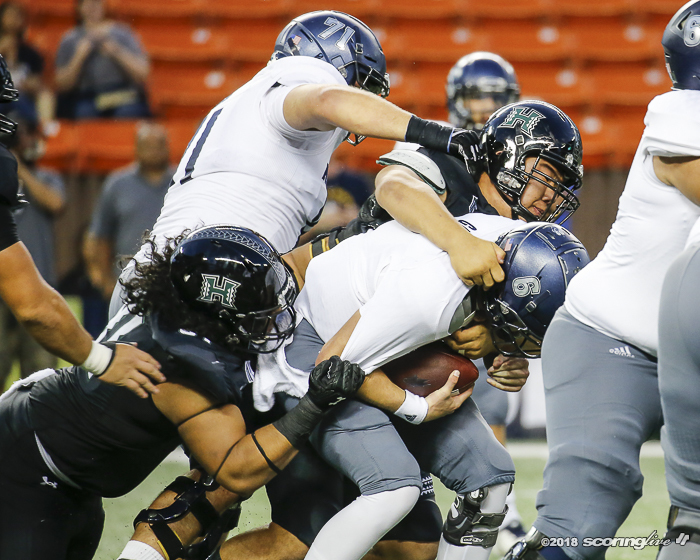 On the final play of the quarter, McDonald launched a shot for John Ursua over the middle for a 70-yard burner. 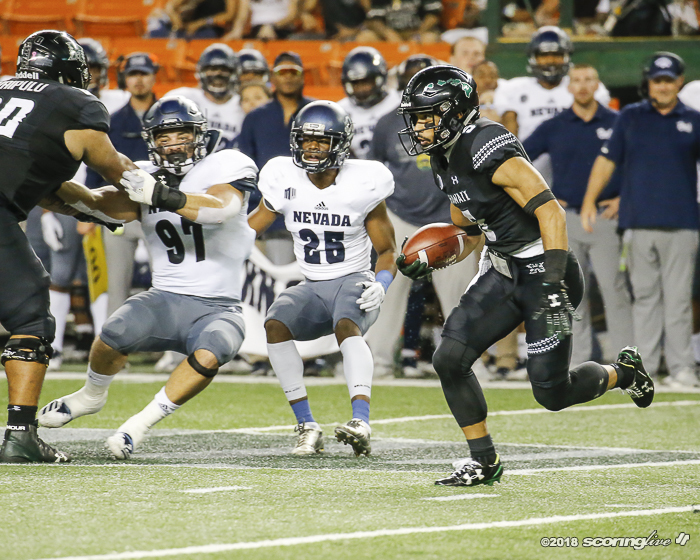 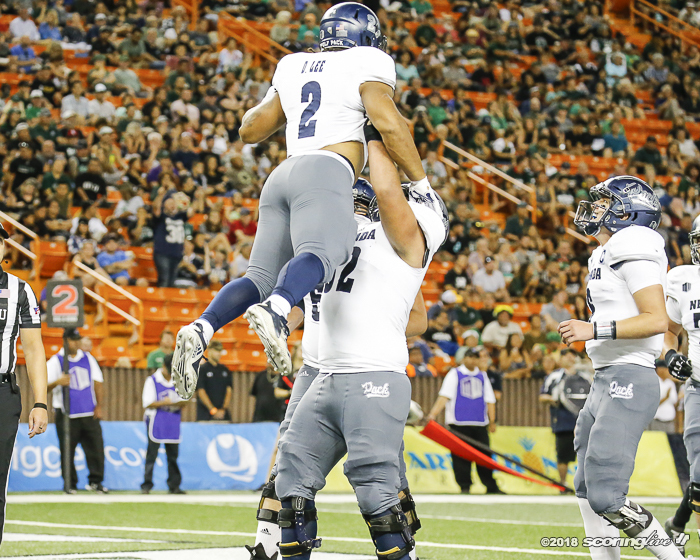 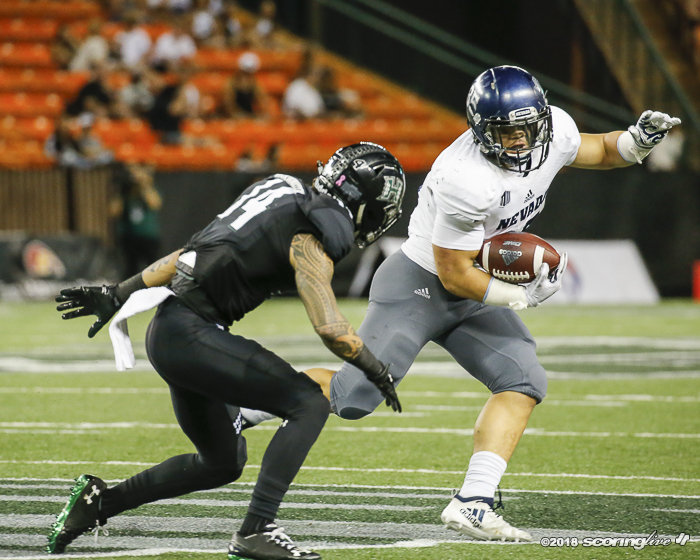 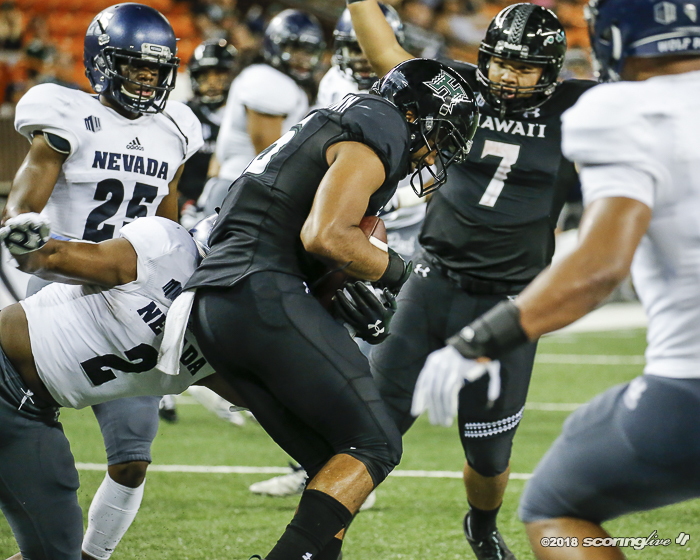 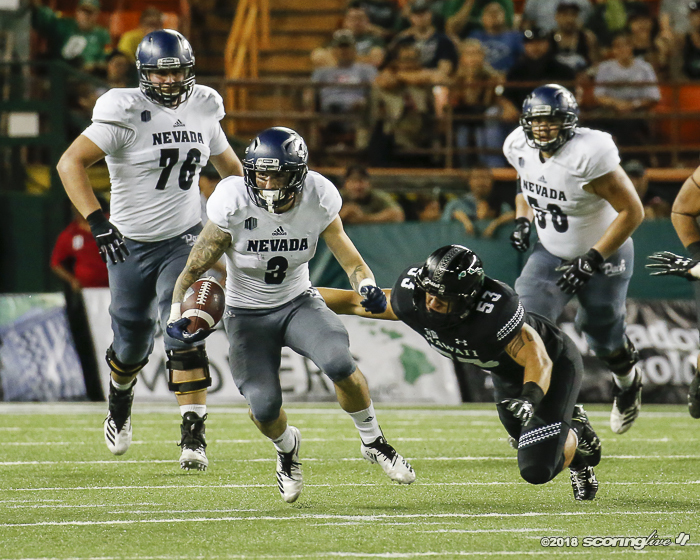 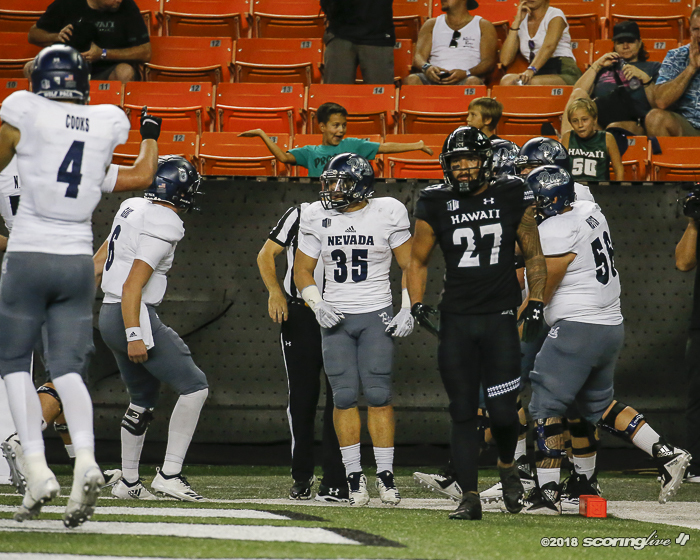 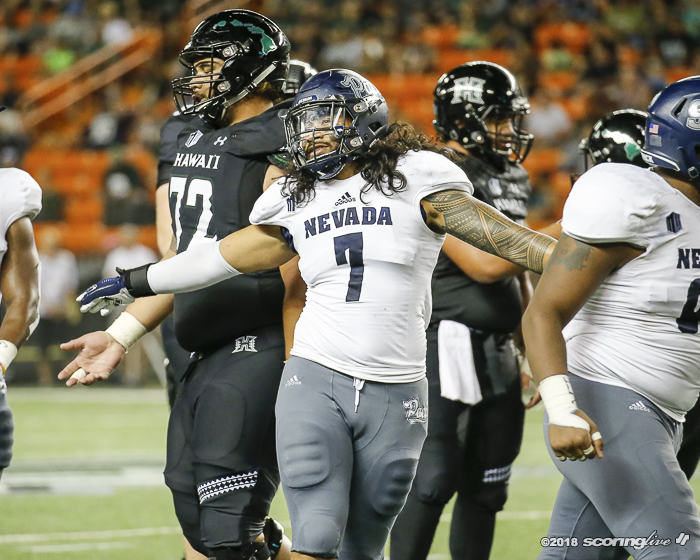 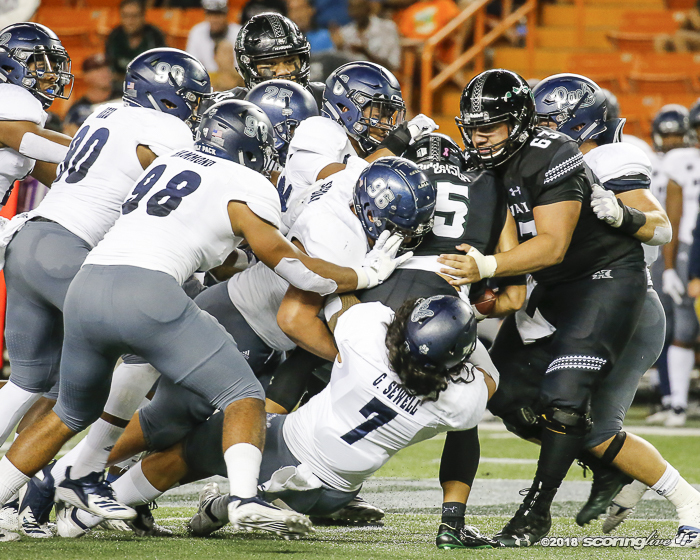 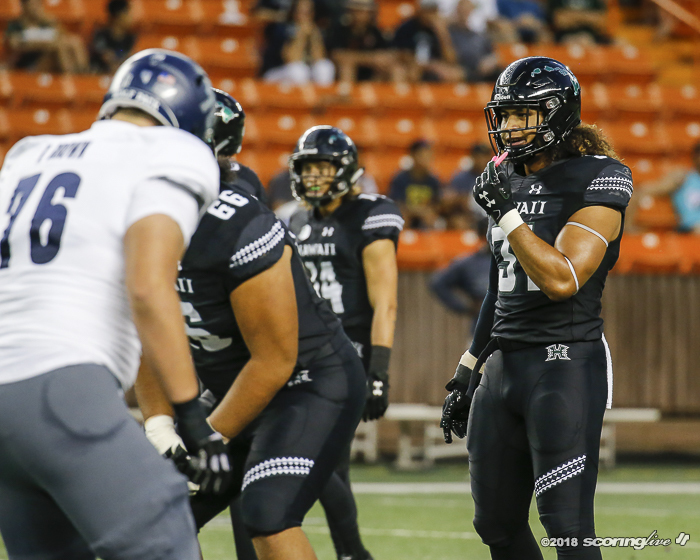 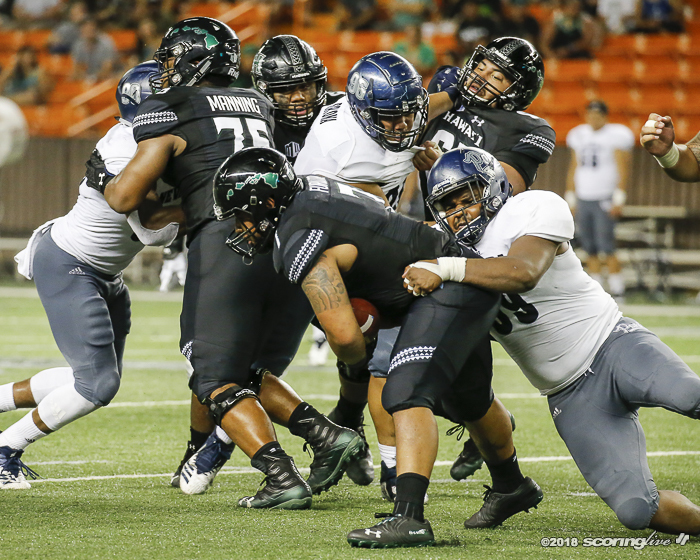 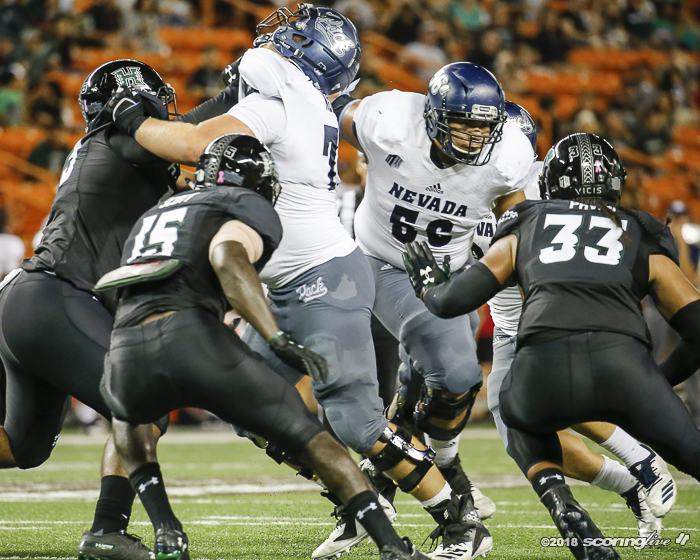 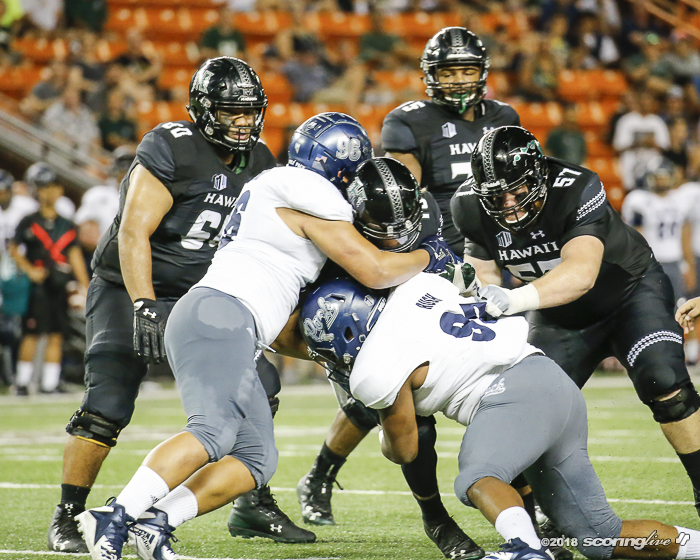 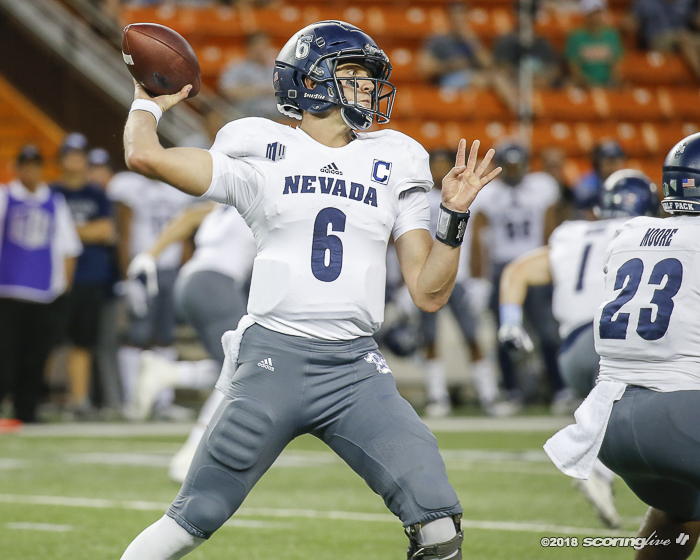 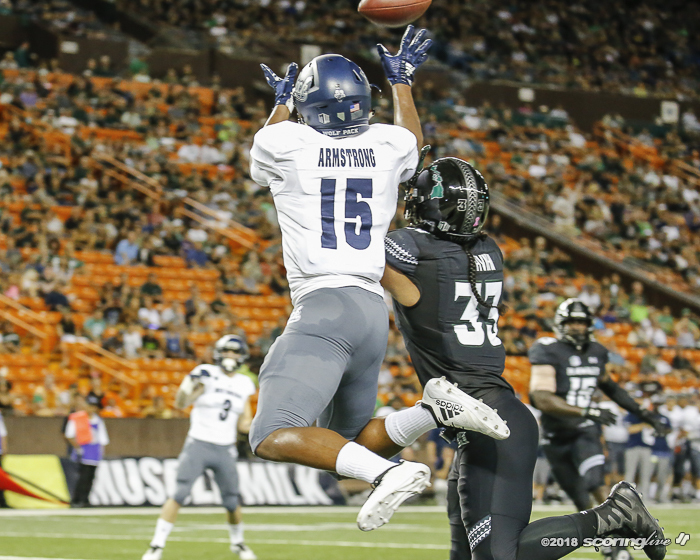 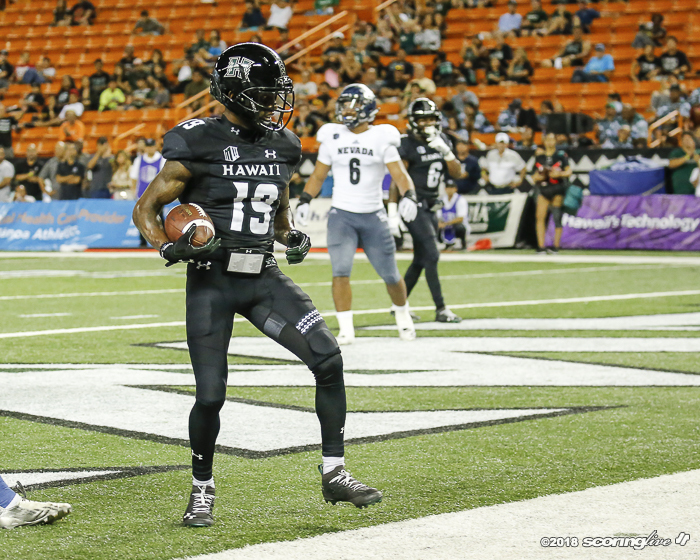 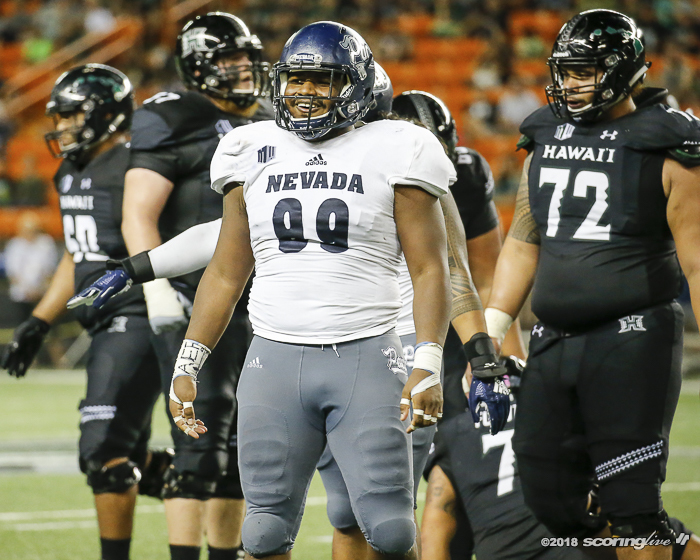 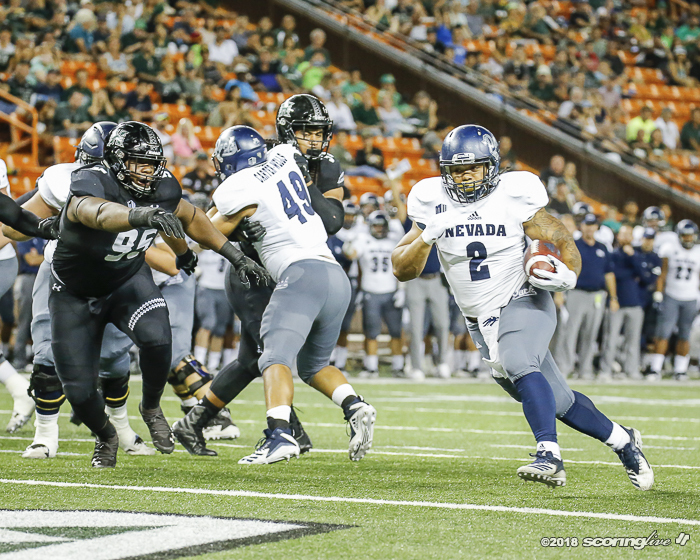 Hawaii came up unsuccessful on its second onside kick attempt of the game and Nevada rolled from there to score 23-unanswered points until late in the fourth quarter. 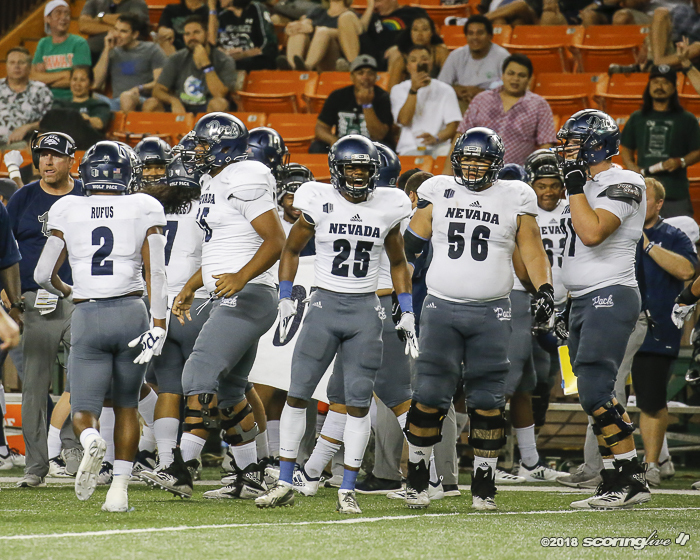 "We haven't been getting better. 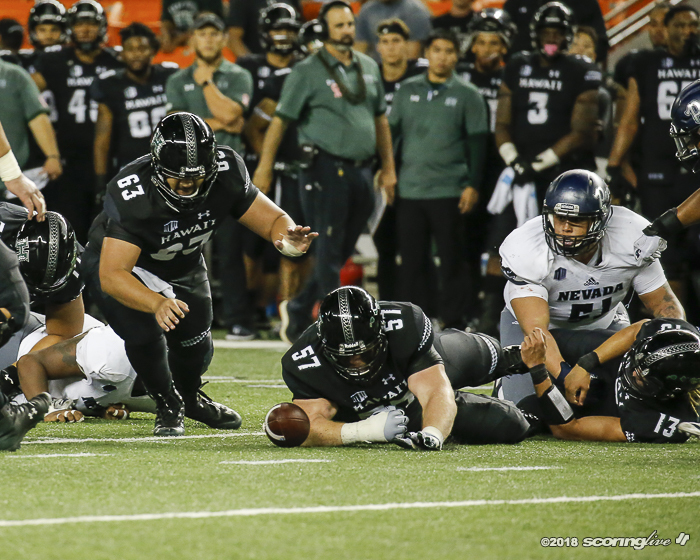 We're making a lot of the same mistakes," Rolovich said. 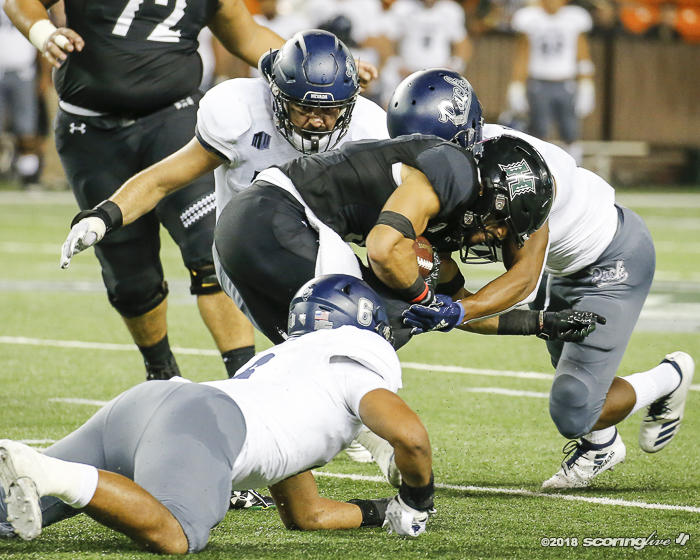 "We have to continually grow in coverage recognition, accuracy, running the ball; all that stuff. 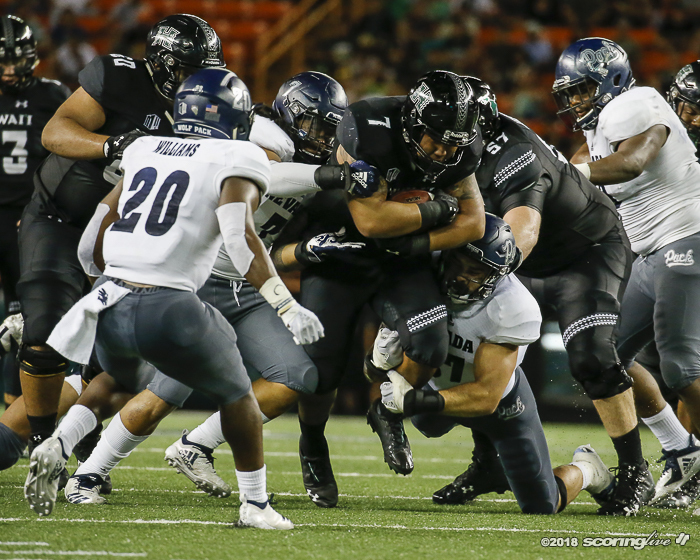 People are going to do different stuff to you throughout the season and (you) better be able to execute your base stuff and be good at it." 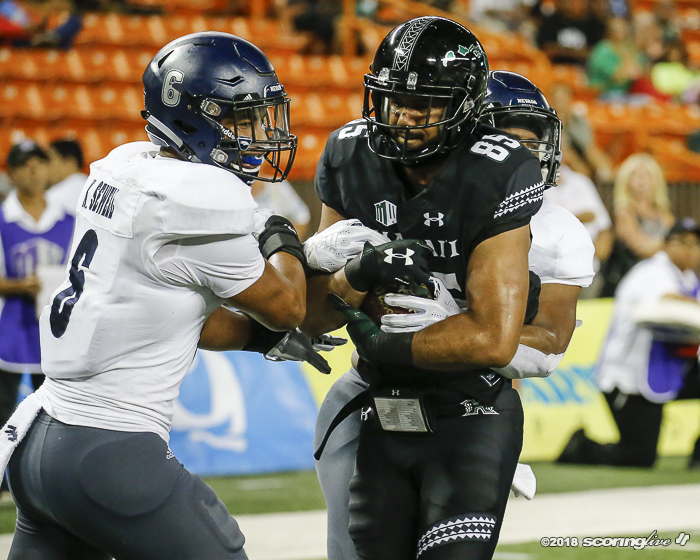 Ursua finished with seven catches for 123 yards and reached a milestone 1,000+ receiving yards on the season. 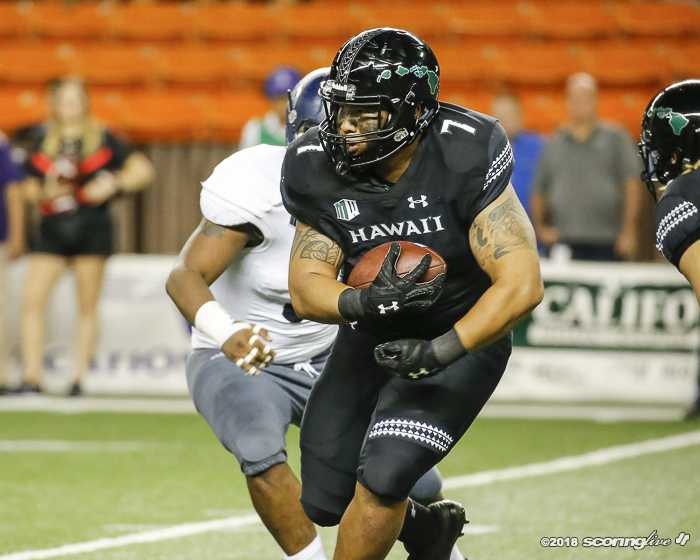 Running back Dayton Furuta (Mililani '14) carried the ball 16 times for 55 yards. 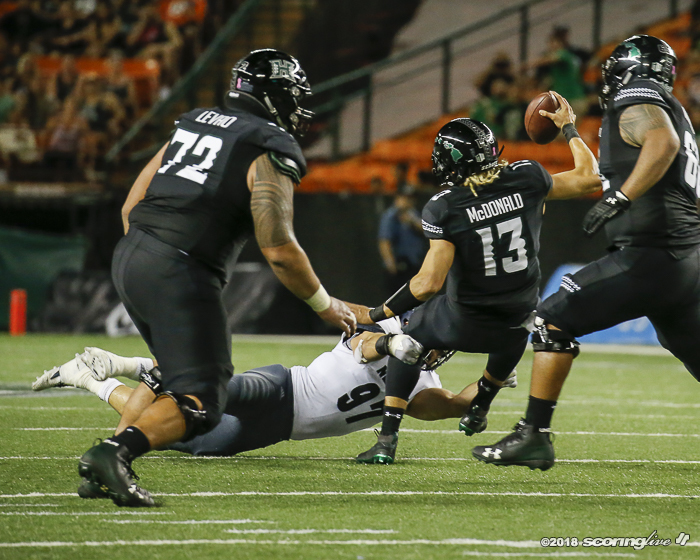 McDonald finished 19 of 37 for 259 yards and three touchdowns. 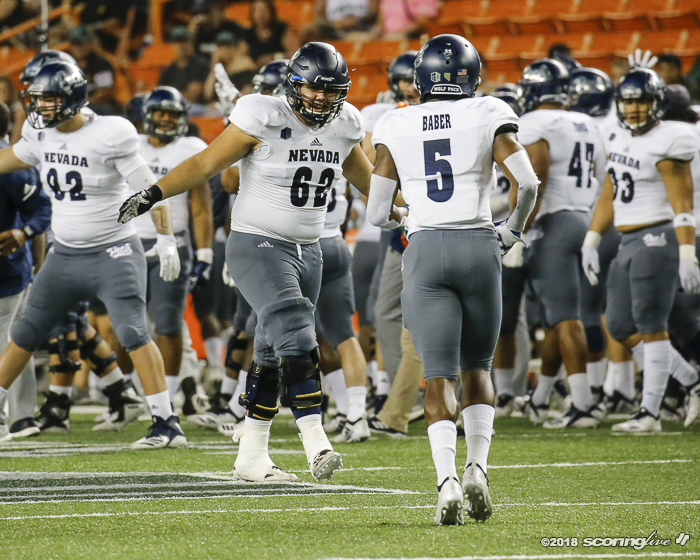 After Nevada scored to make it a 33-14 game in the fourth quarter, freshman quarterback Chevan Cordeiro (Saint Louis '18) made a brief appearance behind center but took a sack and quickly returned to the sideline after Furuta was stopped on fourth and one. 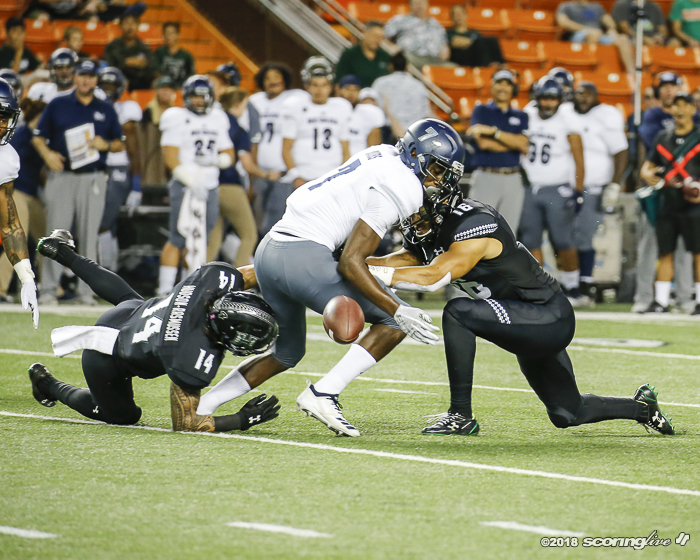 "I just wanted to see if we could get a spark. 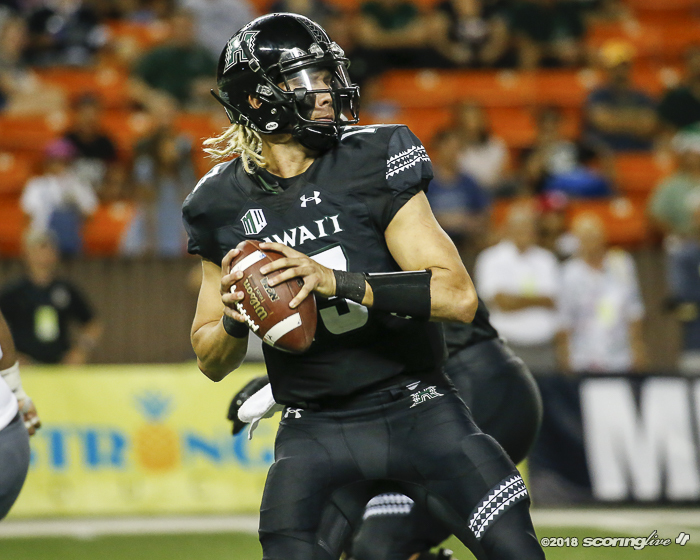 Let Cole see it from the sideline for a bit," Rolovich said. 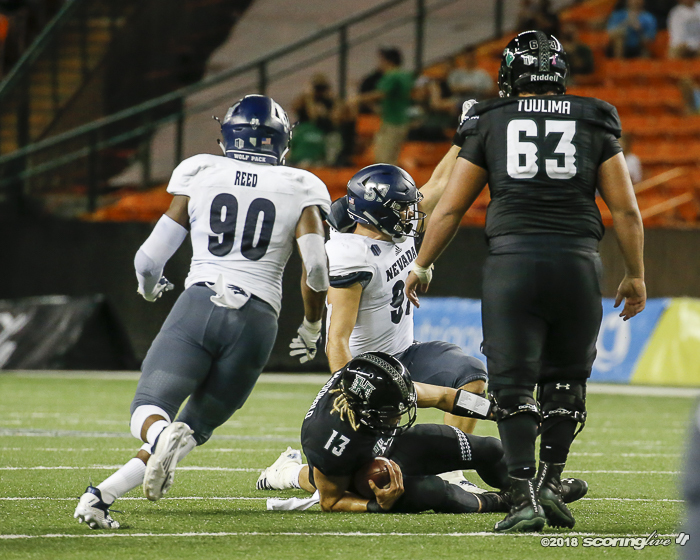 "We were stale. 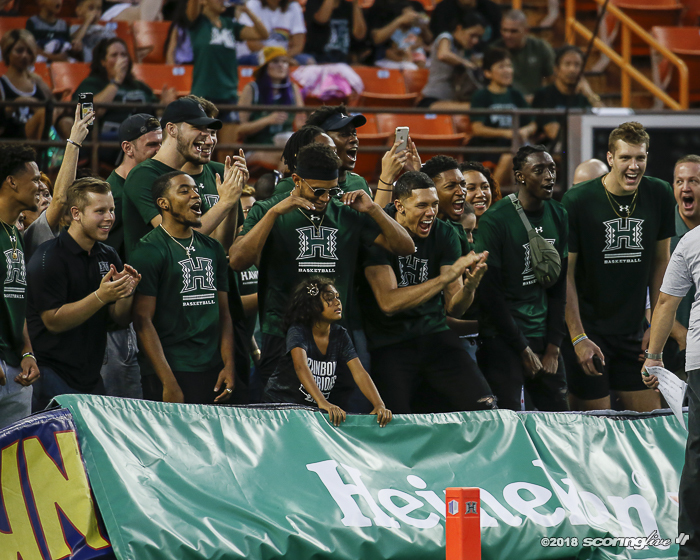 I told Cole, 'Let him get a series. 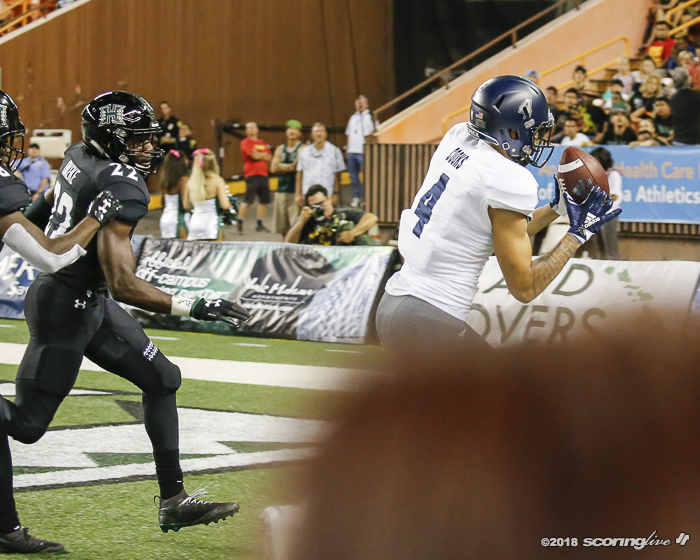 Sit back and see what you're seeing from the sideline.' 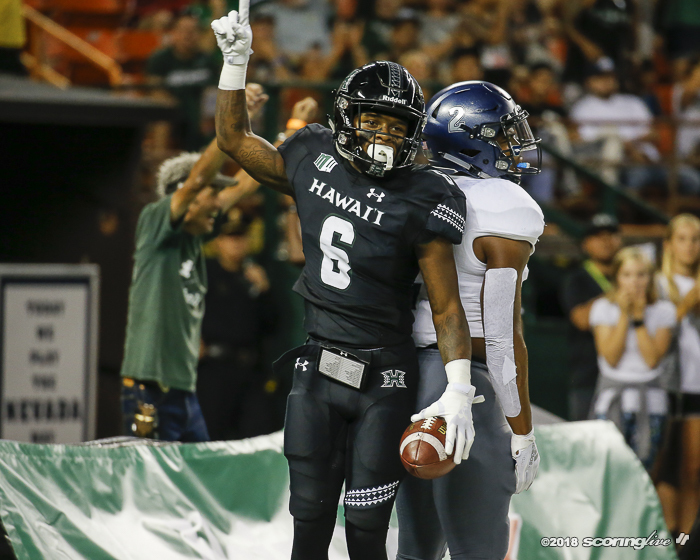 I don't know if it helped him or not but we were able to score another touchdown; it was just too late." 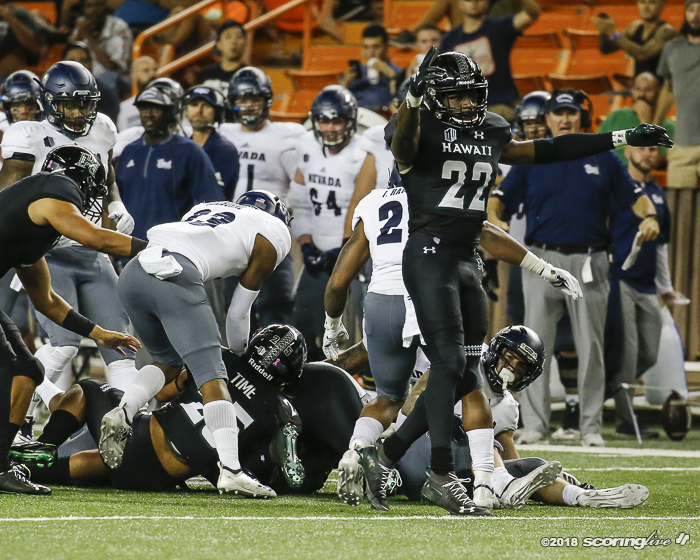 McDonald connected with JoJo Ward for a 2-yard touchdown, and Ursua took a pitch and threw it to Marcus Armstrong-Brown for a successful 2-point conversion. 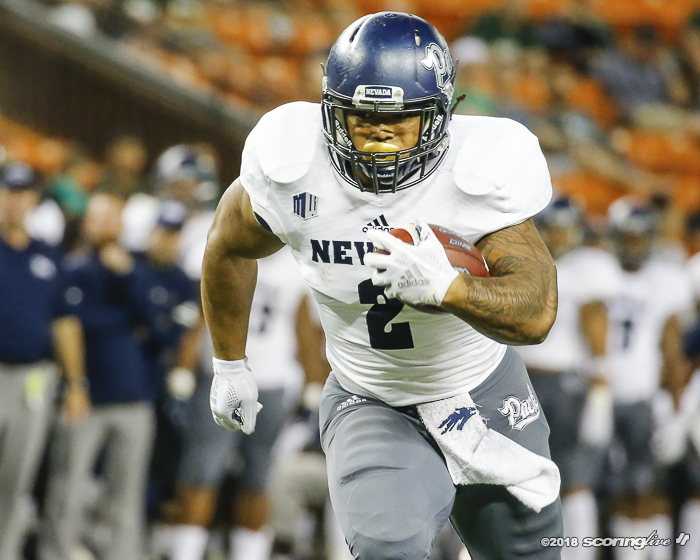 The onside kick was unsuccessful and Wolf Pack running back Lee responded with his second TD of the night. 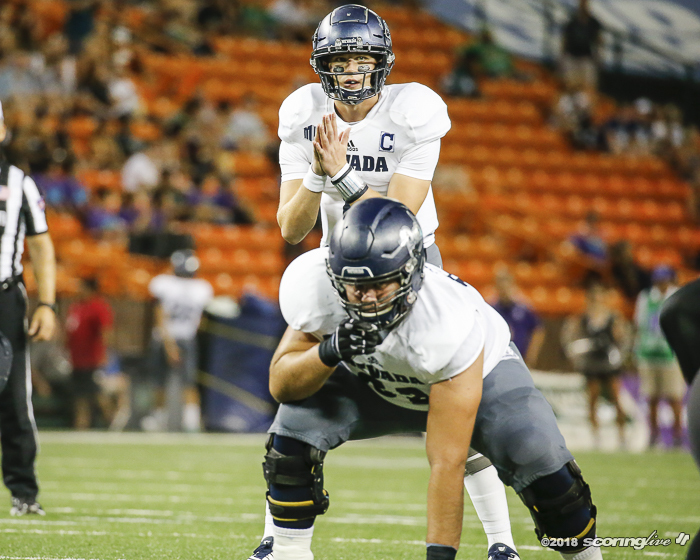 Kamehameha '14 grad Kalei Meyer started the game at right guard for the Wolf Pack. 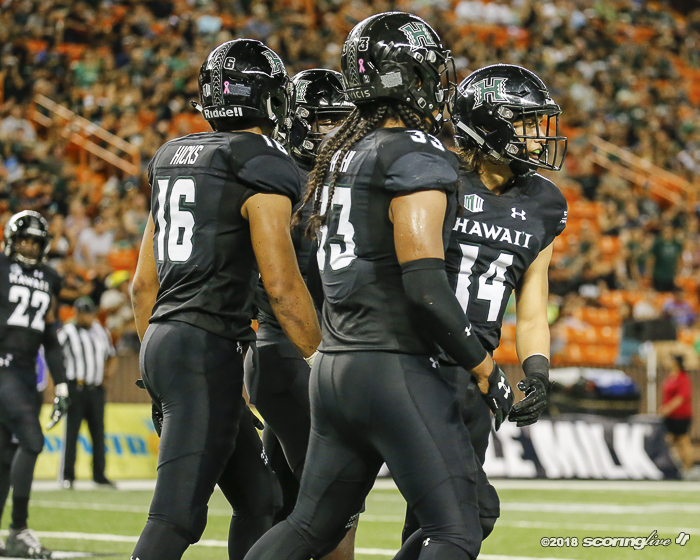 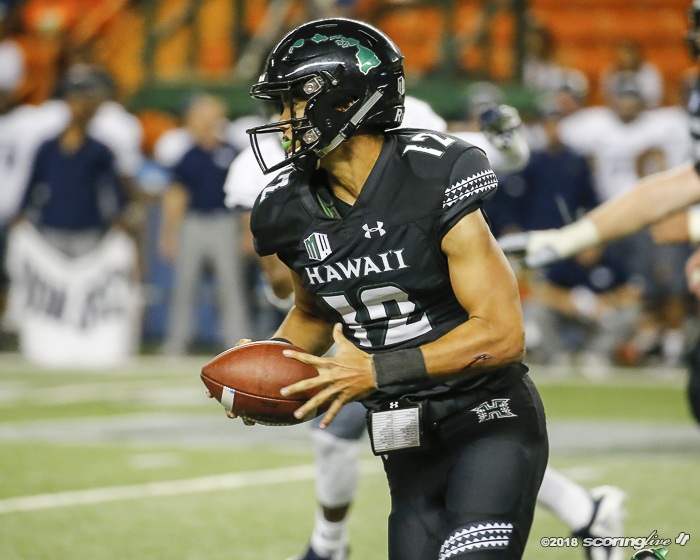 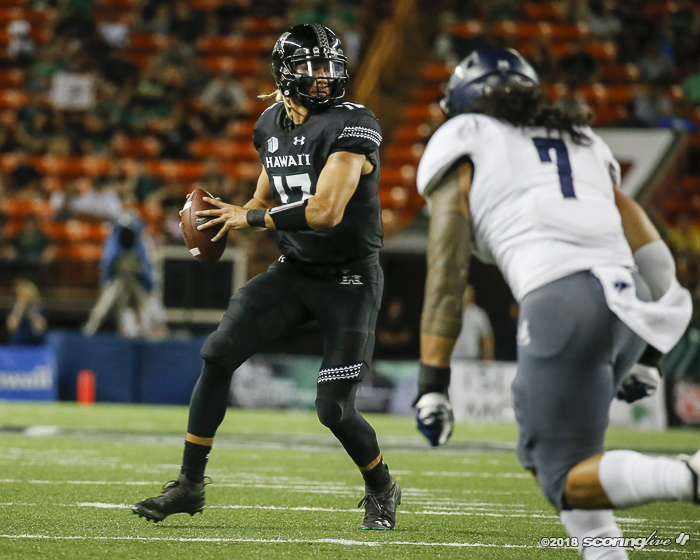 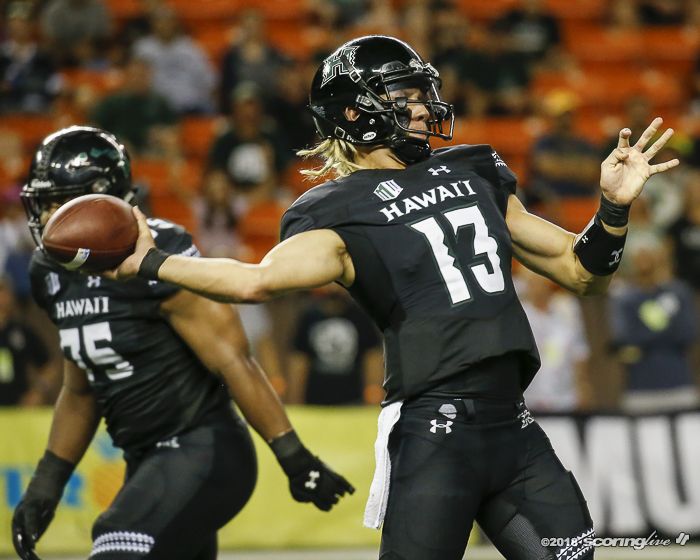 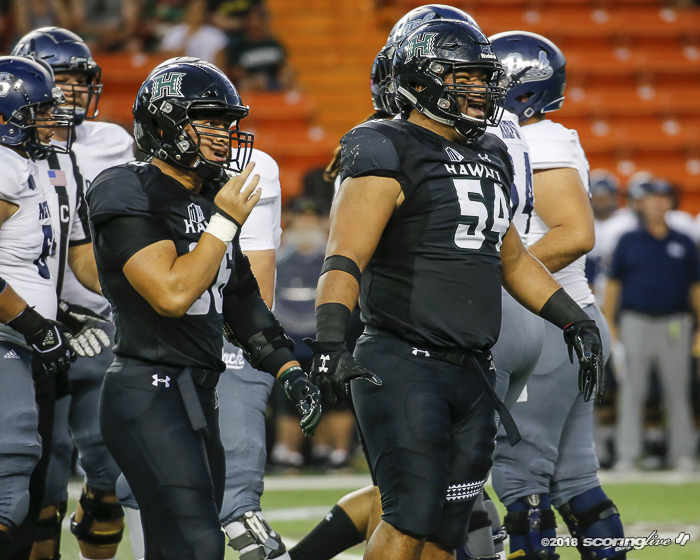 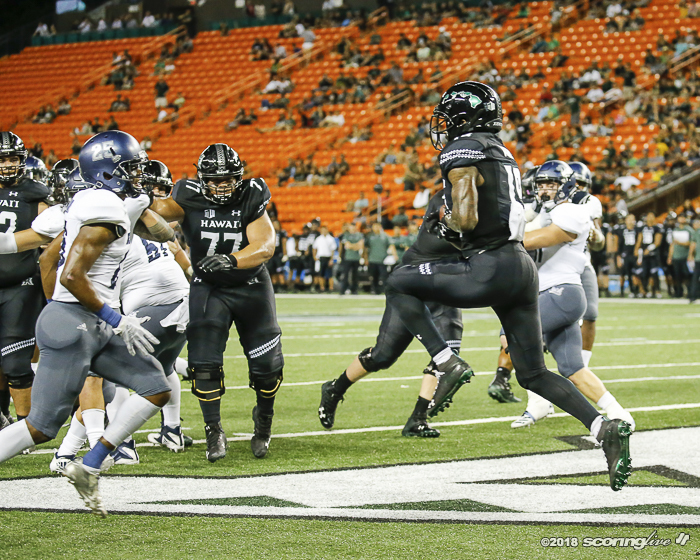 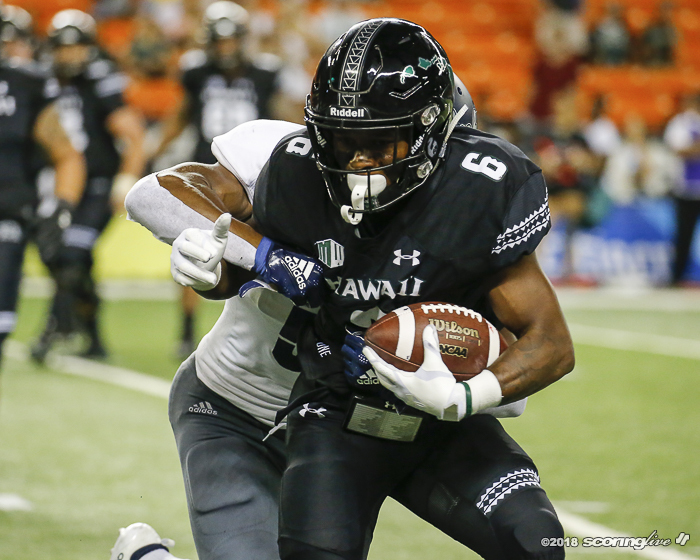 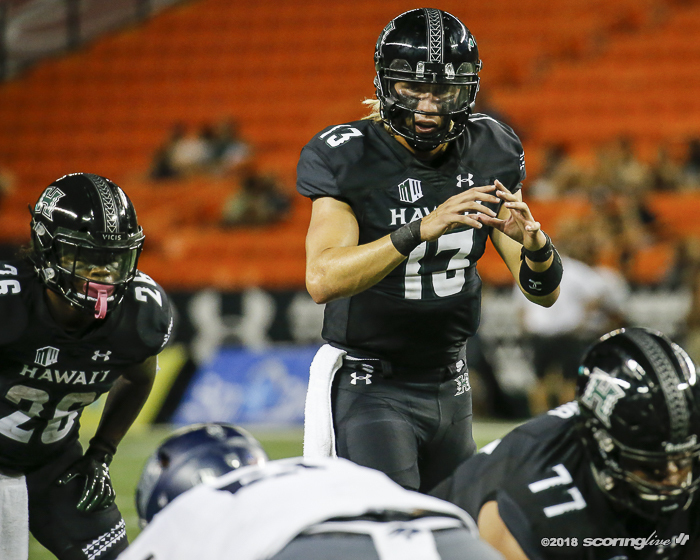 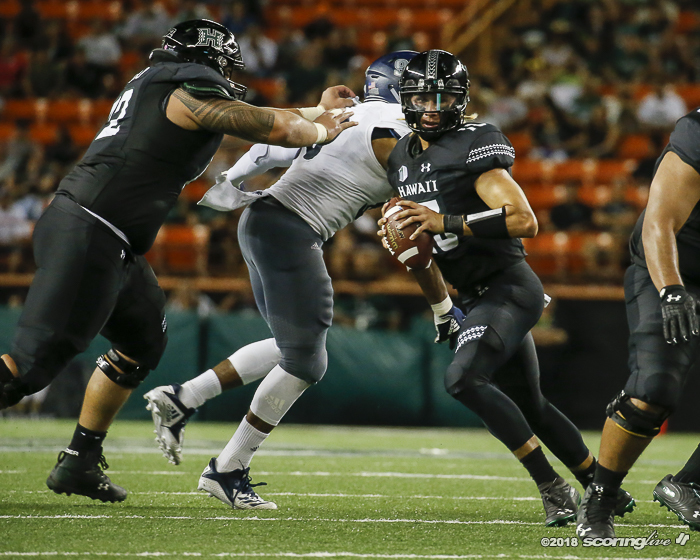 The Rainbow Warriors will have to wait at least one more week before becoming eligible for a postseason bowl game, and the schedule doesn't get any easier with the next two games against the current top school in each of the two Mountain West divisions. 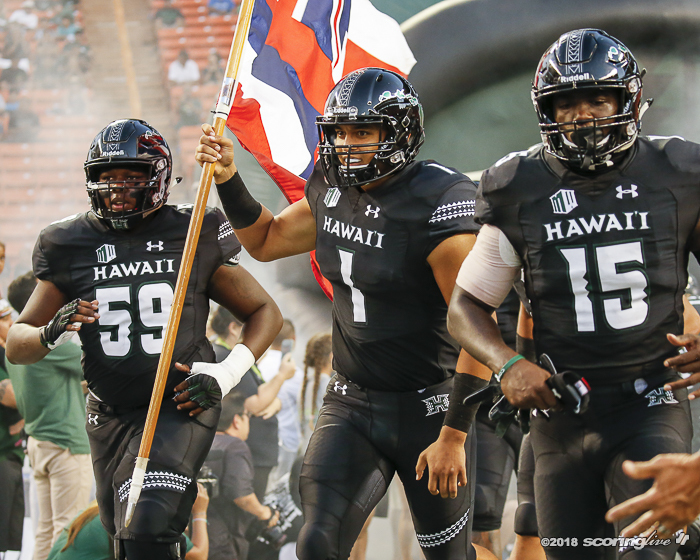 Hawaii will travel to Fresno, California to play the Bulldogs (3-0, 6-1 overall) before returning home to take on Utah State (3-0, 6-1 overall). 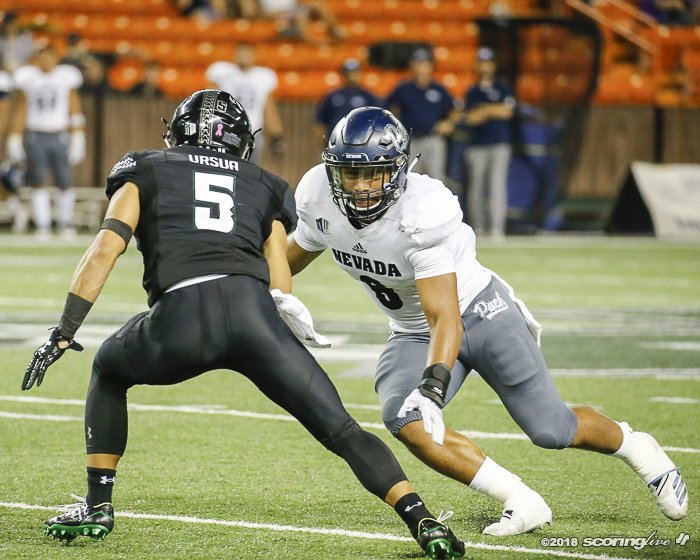 Reach Spencer Honda at [email protected]. 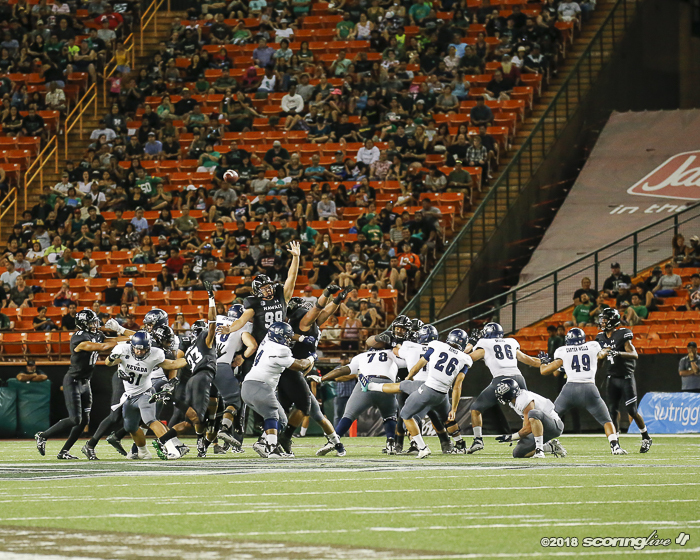 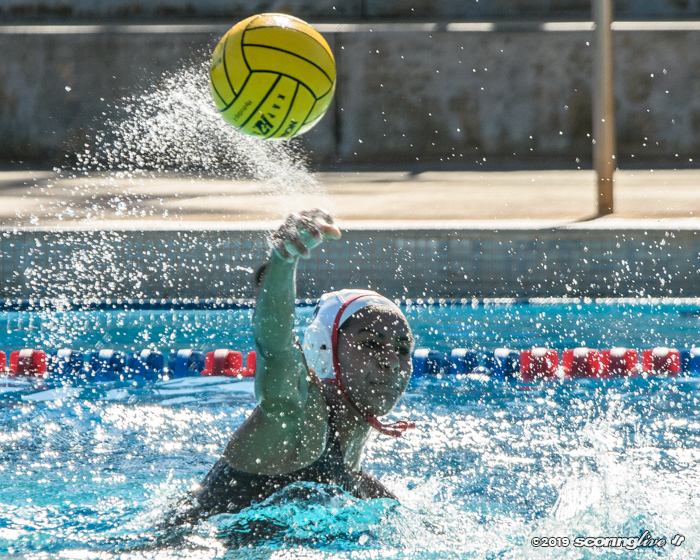 Red Raiders and Kaiser will meet in a rematch for the OIA Championship. 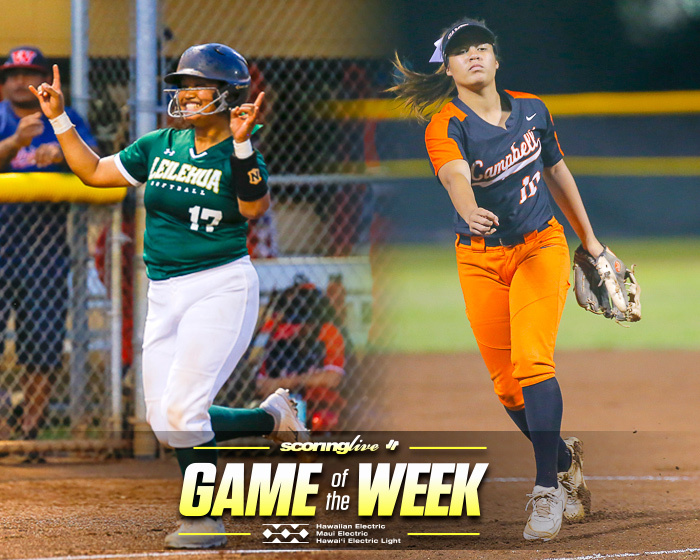 Leilehua is seeking its first league crown, while Campbell is trying for its seventh. 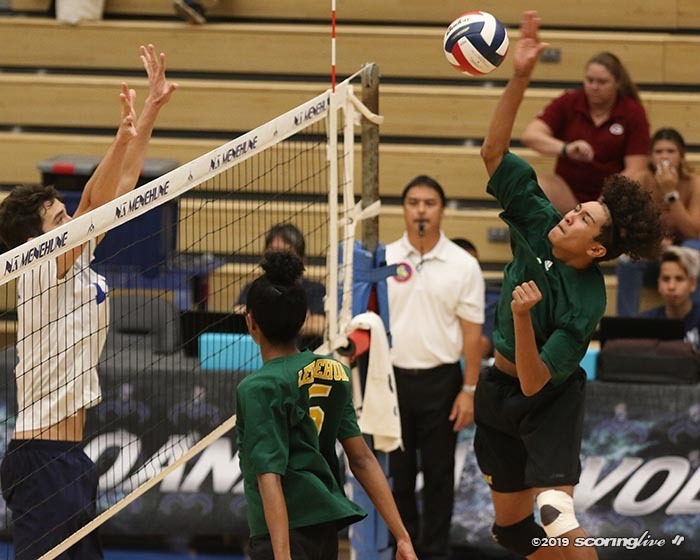 Three players recorded double-digit kills to power the Mules over the Cougars. 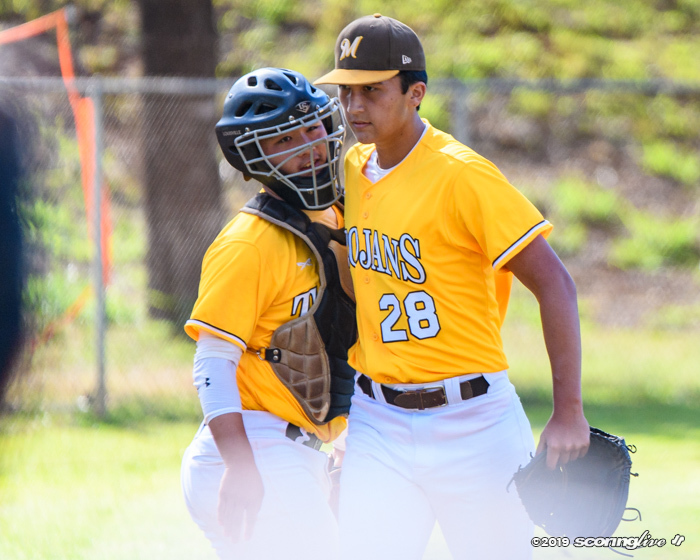 Trojans move into a tie atop OIA West and secured a first round bye for the OIA Playoffs. 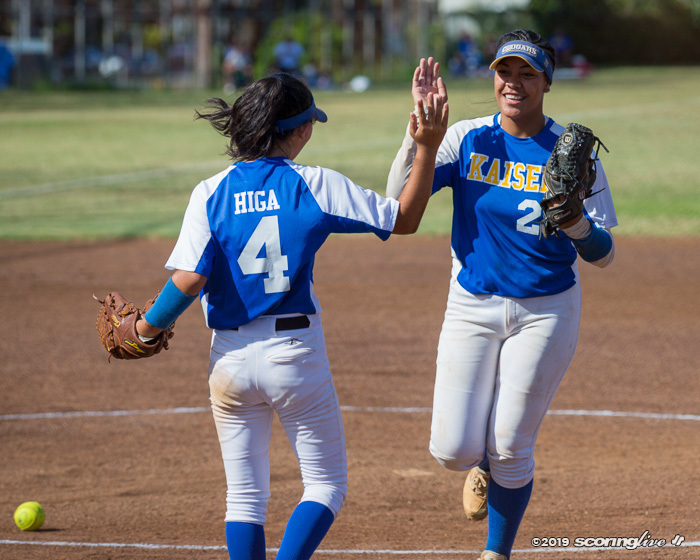 The senior pitcher batted 2 for 3 with an RBI to back her own complete game in the circle. 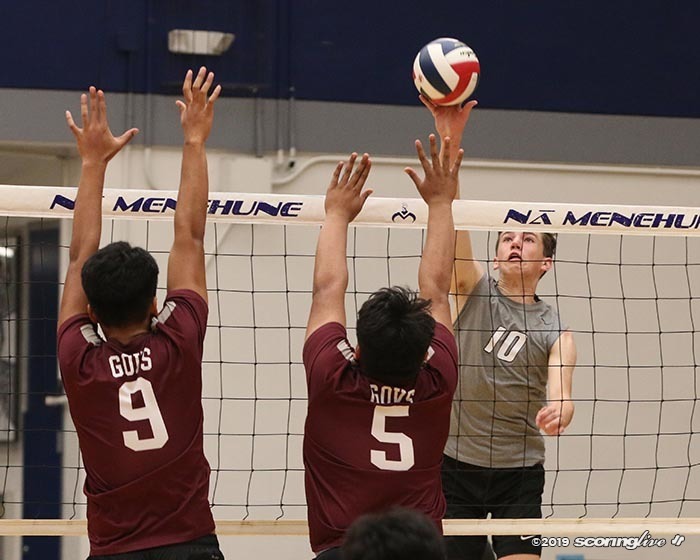 Na Menehune swept the Governors, 25-15, 25-22, 25-19, to advance to the OIA D1 semis.